Seventy large-size illustrations trace Mucha's skills as a draftsman over more than 40 years. Among the more famous examples are original plans and drawings for "The Seasons," sketches for the Sarah Bernhardt poster, studies from Mucha's stunning and innovative stylebooks, and a sketch for the St. Louis World's Fair poster. The artistic legacy of Alphonse Maria Mucha (1860–1939), one of the founders of the Art Nouveau style, is both brilliant and bewilderingly diverse. Mucha is most famous for his Sarah Bernhardt posters and his magnificent decorative panels such as "The Seasons," works that continue to grow in popularity, despite the indifferent quality of most modern reproductions. 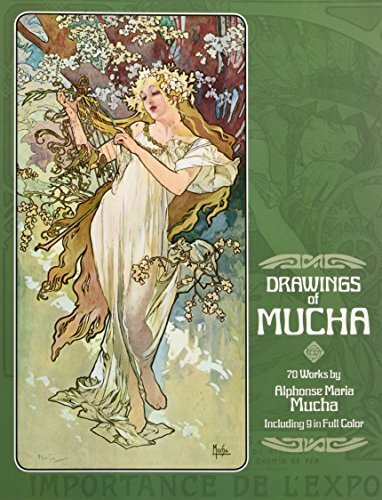 To graphic artists and commercial designers, Mucha is praised for the innovative stylebooks that pioneered the use of Art Nouveau in commercial packaging, design, and ornament. But the primary element in all of Mucha's artistic endeavors—his evocative, highly original draftsmanship—has never been adequately surveyed. This collection of 70 high-quality illustrations—six in black-and-white and nine in full color—offers the first and only comprehensive survey of Mucha's drawings, and as such, provides a unique insight into the aesthetic qualities that were fundamental to all of the artist's work. Reproduced directly from his original drawings, these works span Mucha's entire career and include sketches for his famous book and magazine illustrations, preliminary sketches for paintings, advertising and packaging art, studies for stylebooks, etc. Famous examples include "The Seasons," full-color drawings for the complete set, plus a preliminary charcoal sketch for "Autumn"; St. Louis World's Fair poster, full-color lithograph and preliminary pencil sketch; Sarah Bernhardt, four works in India ink, pencil, etc. ; and "Documents décoratifs" and "Figures décoratives," studies from Mucha's two innovative stylebooks. Naturally, many of these drawing are interesting because they reveal the initial thoughts for famous works but most basically these drawings show that Mucha's draftsmanship—highly admired, even by the cantankerous Whistler—was the brilliant underpinning of his entire craft.